The Franklin D. Roosevelt Presidential Library and Museum in Hyde Park, NY, has reopened after a three-year refurbishing of the building, which FDR gave to the nation through the National Archives. It not only includes his extensive presidential papers, but also Roosevelt’s collections of ship models, rare books, coins, and diplomatic gifts received from other governments. AV systems integration by Electrosonic, working under exhibit fabricator Explus, supports the museum’s narrative and helps visitors interpret a large array of exhibits. The new museum displays were designed by Gallagher & Associates. David Rome was the AV consultant, and AV content was created by Cortina Productions, with linear AV content by Monadnock Media. 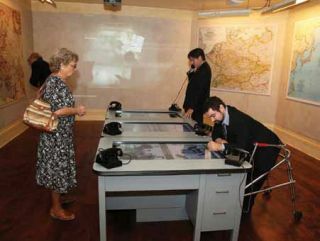 The wartime exhibit includes “FDR’s Secret Map Room” with image projections on the wall from a projectiondesign F22 video projector, plus three multi-user map tables each equipped with a Primeview multi-touch touchscreen showing maps and two 1940s telephones. A large portrait of FDR, hung between a pair of 55-inch Samsung LCD screens showing film footage of the president, dominates the entrance to the museum. The first galleries set the scene of his presidency with an exhibit on the Great Depression and a theater presentation, “The World in Crisis. The theater space is surrounded by a jagged collage of graphic images depicting the sufferings of the early 1930s. The content is displayed on a large screen by a projectiondesign F32 video projector and accompanied by 5.1 surround sound; it features newsreel footage documenting the economic crisis at home and abroad and how, in some cases, it led to the emergence of extremist politics. Nearby, the “Promise of Change” exhibit includes an interactive display about the causes of the Depression; “Foundations of a Public Life,” features personal mementos and an interactive table based on a 46-inch Primeview Quad Touch monitor, which operates as a giant scrapbook detailing the Roosevelts’ privileged upbringings and lives of public service. A 55-inch Samsung LCD with stereo audio describes the turning point in FDR’s life in the “Polio Theater” and how he was able to conceal his condition, in large part, from the public. A pair of exhibits demonstrates how FDR became the first president to understand the importance of radio communication with the nation. One recreates the experience of listening to his Fireside Chat broadcasts with vignettes of a suburban kitchen and dining room; visitors select recordings of FDR’s informal chats and hear them through radio sets of the era. Questions and responses from the public are heard through overhead loudspeakers. A major exhibit on the New Deal and FDR’s second term is followed by a view of the president’s private study and a gallery devoted to World War II . The wartime exhibit includes “FDR’s Secret Map Room” with image projections on the wall from a projectiondesign F22 video projector, plus three multi-user map tables each equipped with a Primeview multi-touch touchscreen showing maps and two 1940s telephones. Next, visitors descend to the basement where they view the president’s Oval Office desk and its amazing collection of objects, interpreted by a touchscreen display; FDR’s Ford automobile, modified with hand controls, so he could drive; representative exhibits from his collections of ship models, paintings, sculptures, and furniture; a portion of the presidential archives; and a gallery devoted to First Lady Eleanor Roosevelt. The “Legacy Theater” presents an assessment of FDR’s achievements. Additional theaters, which feature 55- or 70-inch Samsung LCD screens or projectiondesign F22 and F32 projection systems, are scattered throughout the museum and address “The Enduring New Deal,” “Pearl Harbor” and “Newsreel” topics. Electrosonic standardized the equipment as much as possible in the refurbished museum to minimize the amount of different gear and to promote easy operation and maintenance. A control room in the basement behind the theater houses source equipment for the exhibits. All linear video is run at 1080p from BrightSign HD1020 players. Displays are largely fed using CAT-6 cables and Extron DTP DVI 301 extenders. Totevision 15 and 19-inch LCDs are featured in the exhibits; many 22-inch touchscreens are all-in-one Elo E531206 units with built-in computers. All show audio is processed through a Peavey MediaMatrix DSP system and Crown eight-channel amplifiers, and shared across exhibits as appropriate; smaller exhibits have their own amps. Ambient audio-only exhibits feature Technovision TecMP3 audio servers as sources. The Fireside Chats exhibits use Gilderfluke Sd-50/8 industrial MP3 players. Loudspeakers are mainly from the JBL Control range; several exhibits use NXT flatpanel technology based on Dayton Audio DAEXSFH exciters. Two theaters feature Dakota focused arrays to confine the sound to the listening area. All exhibit AV equipment is centrally controlled with Medialon Manager. Theater shows are started by proximity sensors, and docents can select individual exhibits via Apple’s iPad.